Iranians (or those of Iranian descent) around the world look forward to the celebration of Shab-e Yalda. It's a celebration of our ancient culture, a celebration that dates back to pre-Islamic times. Staying up late and reading Hafez’s poetry, munching on deliciously crunchy and sweet pomegranates, and most importantly, spending time with our friends and family. 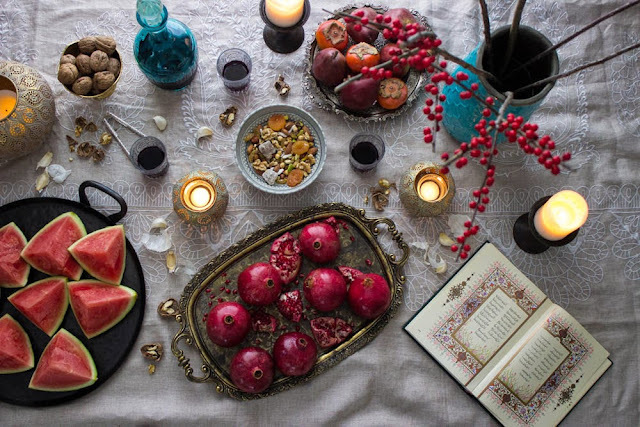 We celebrate the warmth of friends and family because Shab-e Yalda falls on the Winter Solstice which is the longest night of the year. There is a particular synchronicity this year as Saturn returns and shifts into Capricorn (after spending two years in Sagittarius). The planets are shifting, politics are traumatizing us every day (Americans). For many of us 2017 has been a very dark year. The open hostility and hatred towards our community employed by this administration and pointedly, the Muslim Ban impacting our friends and family. While some of us are lucky enough to celebrate this holiday with our loved ones, there are many among us who do not have this luxury. If you are in a prosperous place, please consider donating to a community organization that assists refugees or other communities who support those who need it most. I personally support the NIAC, you can find out more about supporting them here. If you would like to contribute to the NIAC, you can contribute via Paypal here.